Remember the childhood memories of finishing off packets of Parle G in no time? 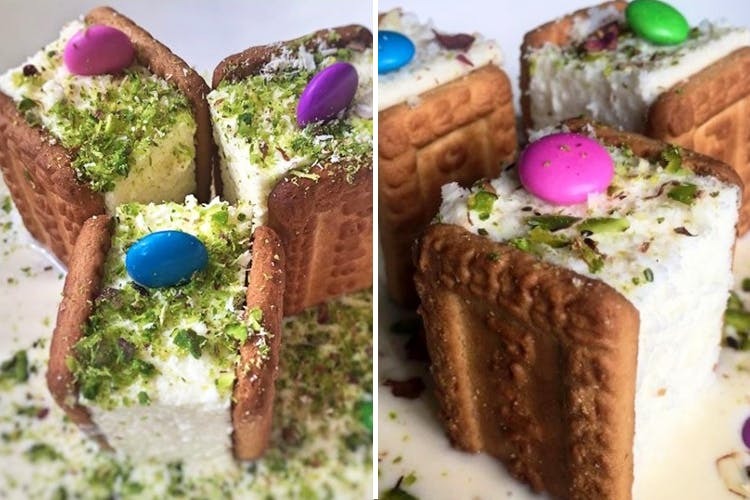 What if we tell you Farzi Cafe at Kalyani Nagar has dished up an interesting dessert with our beloved biscuit, and we are in love with this delectable creation! What happens when your favorite biscuit meets cheese and rabri? Enter, a plate of mouth-watering, Parle G cheesecake, dipped in cookie dough, essence, rabri and served with colorful choco gems. If you’re a sweet tooth, this dessert is a must-try. Creamy yet light, crunchy yet smooth, Parle G cheesecake is undoubtedly one of the best sellers at Farzi! Cheese, cake, cookie dough and Parle G, we have a winner, guys!